In January 2014, a sub-polar vortex caused the small town of Hell, Michigan to freeze over, which inspired in Prufrock a high energy, over-the-top performance poem about the limits of what is achievable. 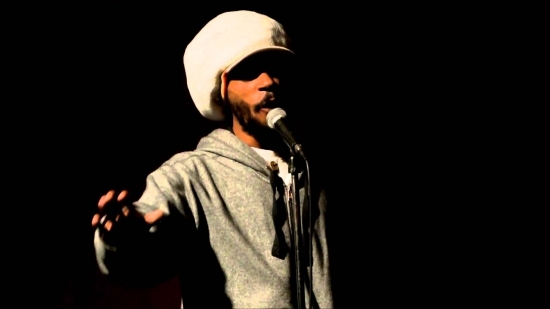 Prufrock’s mix of hard-hitting political, personal and comedic material saw him crowned the 2015 Canadian Individual Poetry Slam (CIPS) Champion. The road to CIPS was a long one for Prufrock. Literally. It was 43 hours by bus from Ottawa to Saskatoon, and then another 22 hours by car to Vancouver. He describes the experience of winning as both “relieving and humbling”. But he remains focused on the road ahead. Prufrock Shadowrunner has been a fixture in Canadian spoken word since he burst onto the scene at the 2010 Canadian Festival of Spoken Word (CFSW) in Ottawa. As a member of Ottawa’s Capital Slam team, he wound up being crowned national slam champion in his home city. Not bad for a first time outing. Since then, he has slammed competitively in four straight CFSWs, and in all five Canadian Individual Poetry Slam competitions. "I don't play basketball anymore, so slam is my game," says Prufrock. On top of being the current Canadian Individual Slam Champion, Prufrock has accumulated numerous professional achievements in poetry and performance over the past five years, including: Winning Team, CFSW 2010 and 2014; Winner, Toronto International Poetry Slam, 2011; Finalist, CFSW 2011; Finalist, CIPS 2013. He was also published in The Great Black North: Contemporary African Canadian Poetry (2013). Prufrock has served as a leader in his community and as a mentor to younger poets, coaching the Ottawa Youth Poetry Slam teams two years in a row (2013, 2014), and has run poetry workshops for youth and adults alike across the country. Prufrock recently announced that he’s releasing his first full-length spoken word album in summer 2015, collaborating with producer Plan A on the project, which is titled Sweat Equity. "The album has been in the works for the past 4 years and we are excited to get that out," says Prufrock. "When that project is released, I am going to begin work on my next solo project." The forthcoming solo album will be his fourth independent hip hop release. Since starting out in spoken word, Prufrock has remained a prolific and talented hip hop artist, releasing three solo recording projects in that time, including Master of the Flying Guillotine (2010), Fist to the Sky (2011), and Houligans w/ D-Vicious (2013). In addition to his solo work, Prufrock is also a member of the Ottawa based hip hop group: The Missing LinX, with Just Jamaal, Obsidian (formerly known as Hyfidelik), and MC the Poet. The four of them were members of the Ottawa Urban Legends slam team at the 2011 Canadian Festival of Spoken Word and found instant performance chemistry together. "Missing LinX is an extension of the 4 of us as one consciousness," says Prufrock. "We just have a connection that allows us to reach new heights in terms of concepts and ideas." The four of them initially garnered attention at the 2011 Canadian Festival of Spoken Word in Toronto for their team unity and tight team performances, including a notable and highly choreographed dance poem on finals stage. Their new album, Spaxe Camels will be out later this year, following their 2012 debut, R.I.P. Charlie. Although Prufrock’s work is firmly rooted in hip hop, his spoken word has expanded beyond traditional rhyme schemes. "I have moved away from the rhyming in recent years, cause I find when it comes to spoken word, sticking to just rhyming is limiting," says Prufrock, whose work has come to be influenced by free verse poetry. Although the poetry slam has a certain magnetism to it, Prufrock's body of work is too diverse to be confined to any one category. He was a member of the inaugural Victoria Spoken Word Festival (2011), and then returned for the alumni festival (2015). The festival took spoken word outside the rigid confinements of the poetry slam and experimented with interdisciplinary creation. During the 2015 festival, Prufrock collaborated with members of Victoria-based dance troupe Broken Rhythms as a part of the Poetry in Motion showcase. Together, they combined his poem Apocalypse Beach with creative lighting effects and interpretive dance to create an ominous ode to the end of the world. He also performed site-specific work at the Royal BC Museum, creating and debuting brand-new works in as little as an hour. He collaborated with fellow spoken word artist Johnny MacRae, and created a spoken word piece based on photographs in the Wildlife Photographer of the Year 2014 exhibit. Their piece was inspired by photographs of garbage dumps and whaling yards to explore the negative impact of human progress on the natural world.As one of the most talented spoken word artists in Canada, Prufrock is consistently pushing the envelope, and developing new and exciting work. But Prufrock’s true passion is working as a DJ. "As much as I love spoken word, my real, true love is DJing,” says Prufrock. “I feel the most comfortable behind a pair of technic 1200s. I let the music and sounds speak for me." Whether behind a set of turntables or a microphone, Prufrock is one of the most prolific, exciting and influential artists working in contemporary Canadian performance today.